As Ontario and other provinces move toward a greener economy, policymakers should consider the implications of these changes on employment opportunities, and particularly opportunities for decent work. 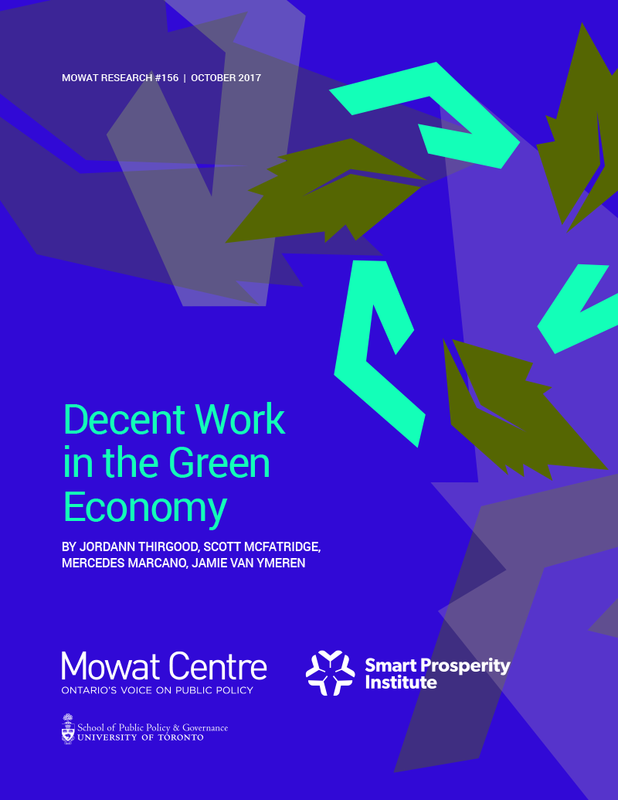 Decent Work in the Green Economy, a new report from the Mowat Centre and Smart Prosperity Institute, explores this challenge. The report identifies where workers might be vulnerable to disruption, and considers where policy intervention may be beneficial. The report combines research on both green transitions worldwide and labour market trends in Ontario with an applied economic and technological model of Ontario’s cap and trade program, an analysis of relevant policy concepts, expert interviews and ongoing engagement with stakeholders within government, industry, labour and social justice circles. It aims to bring together the critical policy conversations around decent work and the transition to the green economy. Economies around the world are in transition as businesses, citizens and governments embrace new ways of generating growth that put less strain on the planet. For many economic sectors, the transition to a green economy means opportunity. For other sectors, the transition is potentially disruptive. Good government policy is necessary in both instances to ensure that the benefits of the green transition accrue to all, and that any negative impacts on sectors, communities and workers are effectively managed. In Ontario, the transition to a low-polluting, resource-efficient economy is occurring at the same time as other disruptions: employment continues to shift away from goods-producing sectors and toward services and knowledge-intensive industries; rapid technological change is automating routine tasks, putting some traditional occupations at risk; work is becoming more precarious; and wages remain stagnant amid rising living costs. Further, the impacts of these changes are not distributed evenly across society, amplifying existing inequalities. Initiating a conversation between those actively supporting the transition to a green economy and those advocating for decent work is indispensable. Communicating the economic and business opportunities that a green economy will bring to both industry and workers will be vital to ensure the success and momentum of the transition. The benefits must be shared, and any negative impacts associated with this transition need to be identified, mitigated and managed to ensure prosperity for all. Importantly, this conversation must address the need for equal opportunities among historically disadvantaged and equity-seeking groups who currently face barriers to accessing decent work. If the right policies are not put in place through the green transition, we will have missed a vital economic and environmental opportunity to draw upon the diverse skills and perspectives of all Ontarians to solve today’s pressing challenges. Ontario’s green transition will be similar to those in other jurisdictions in that it will impact workers and reverberate throughout most sectors of the economy. Compared to business-as-usual, some sectors are expected to grow under a green transition (e.g. utilities – especially renewable energy – and waste management and remediation services); others may see lower growth (e.g. certain heavy industry sub-sectors such as petroleum refining and petrochemical production), and the skills demand and employment profiles of many others could be transformed (e.g. mining, manufacturing, forestry). These sectoral changes will directly affect workers and their ability to access decent work. For example, most sectors that are expected to grow under a green transition tend to have higher wages than the provincial average and will likely see growth in jobs that require high levels of education and specialized skills (e.g. science and engineering, operations management, skilled trades). This raises important questions regarding access to post-secondary education, skills development and re-training. It also raises questions about which workers will experience positive impacts, and which workers will experience negative impacts. Importantly, there are a number of marginalized communities that currently face inequities and barriers to accessing decent work in Ontario, which may be exacerbated by the green transition. For example, women and racialized communities appear to be underrepresented in the utilities sector – which is expected to see rapid growth in a green transition – and increased “credentialism” in green sectors may disadvantage newcomers to Canada who lack the necessary Canadian experience. Public policy has a pivotal role in addressing the labour market impacts associated with the green transition, and many of the policies for ensuring decent work in the green economy are the same as those for promoting decent work in any economy. In particular, active labour market policies and strong social policies – such as Employment Insurance, affordable and accessible post-secondary education, access to lifelong training and skills upgrading – will be essential to support workers in the green transition. However, the green transition also poses some unique challenges as the governments increase their policy ambition. Policymakers should consider their options in key areas such as explicitly assessing the impacts on workers in green economy policy design, developing a comprehensive strategy to support workers in the transition to a green economy, tailoring workforce development measures, leveraging government procurement and spending power, rethinking broader social programs and striving for better data collection. The transition to a green economy is happening irrespective of government direction. It is being driven by citizens and business and by global trends. In Ontario, the transition will have unique reverberations – both positive and negative – on economic sectors and the people who work in them. But the pace of the green transition worldwide cannot be fully predicted, posing a challenge to policymakers. Nevertheless, policymakers need to forecast and anticipate these impacts as best as they can, and ensure that policies and programs are in place that harness the full strength of Ontario’s diverse workforce to succeed in the green economy of the 21st century. This report begins by defining the conversation and outlining the recent changes in Ontario’s green transition and broader economy, followed by a scan of sectoral impacts informed by a literature review on the impacts of environmental policy, as well as a modelling analysis of Ontario’s cap and trade program. The impacts on jobs and workers on the ground are explored, particularly for those already facing systemic barriers. Finally, the report highlights a number of policy options for supporting workers in Ontario’s transition to a green economy.